The Florida based pianist presents his exciting new Trio project, which utilizes and re-interprets ‘everyday sounds’ captured during a 2- year period in 5 countries. These familiar ‘sounds’ and ‘noises’ are at the core of Gottschlich’s compositions and become a springboard for the Trio’s improvisations. 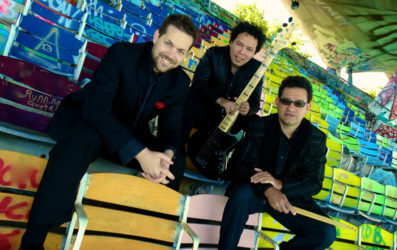 Markus Gottschlich, currently living in Miami, is a Steinway Artist, former Artistic Director of the Miami Beach Jazz Festival and founder of Jazz Academy Miami (JAM). He has toured the US, Asia and Europe and recorded with several Grammy and Latin Grammy Award winning artists. Originally from Indiana, Gary Campbell was active in the innovative NY loft scene the late 60’s through the 70’s – the testing ground for dozens of creative, young jazz musicians. He has shared stages with Michael and Randy Brecker, John Scofield, Dave Liebman, Tom Harrell, Jaco Pastorius, Dr. Lonnie Smith, Andy Laverne, Red Rodney, James Moody, George Adams, Hank Crawford, Mose Allison, Conrad Herwig, Richie Beirach, Arturo Sandoval, Nasheet Waits, and more. Currently the head of Florida International University Jazz Studies, Gary has been awarded numerous National Endowment for the Arts performance grants and has published five highly acclaimed books on jazz improvisation. For the past four years Gary has been a member of the Miroslav Vitous Quartet, recording, and touring Europe, appearing as featured soloists on “Universal Syncopations 2”, and “Remembering Weather Report” both on the ECM label.